ON JULY 2, when Mumbai Congress president Sanjay Nirupam accused Chief Minister Devendra Fadnavis of “blessing” an alleged land scam, he cornered the state government like never before and delivered a blow to Fadnavis’s clean image. At a packed media briefing, Nirupam, along with former chief minister Prithviraj Chavan and Congress spokesperson Randeep Surjewala, accused the chief minister’s office of facilitating a land deal in which a 24-acre plot in Navi Mumbai, apparently worth Rs 1,767 crore, was pocketed by a builder for just Rs 3.6 crore. The Congress leaders demanded Fadnavis’s resignation and a judicial inquiry into the deal. They claimed that the developer, Paradise Group, wanted land close to the upcoming international airport in Navi Mumbai. “A modus operandi was adopted to identify gullible oustee farmers of the Koyna dam [project] for the purpose of getting CIDCO land allotted [to the affected] and to simultaneously get this land transferred to a private developer,” said Nirupam. The leaders also alleged that Manish Bathija, managing director of the Paradise Group, was close to BJP legislator Prasad Lad, who is apparently close to Fadnavis. They then showed pictures of Bathija and Lad having meals together. Surjewala demanded an impartial judicial inquiry headed by two sitting judges of the Bombay High Court. With the Congress in attack mode, the BJP had to act quickly. Spokesperson Madhav Bhandari and Lad were tasked with launching a counterattack. Lad announced that he would file a Rs 500 crore criminal defamation suit against the Congress leaders, while Bhandari said the allegations were baseless. 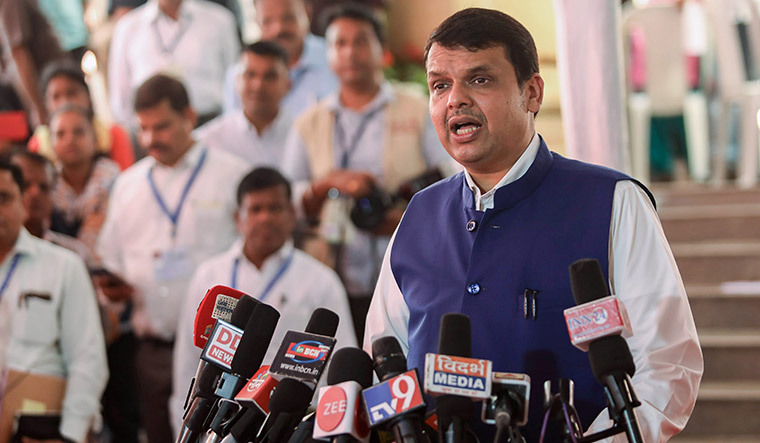 On July 5, Fadnavis addressed the situation, ordering a judicial inquiry not just into the Paradise Group land deal, but also into 200 similar land allotments that had taken place during the previous Congress-Nationalist Congress Party rule.